Lock in a great price for Treebo Trend Wilson Garden – rated 8.3 by recent guests! The staff was very helpful and always at their toes to assist the guests. The rooms were spacious and clean. Breakfast was sumptuous and delicious. Excellent service by staff particularly reception person. Good breakfast. Clean bed, room and toilet. Good room lighting. Good toiletaries. Affordable costing. I visited this place for the second time and the experience was even better than the last. The staff is extremely courteous, helpful and so forthcoming. Rooms are so clean and their maintenance levels truly reflect well. Check in, check out was seamless. It is located well within range to move to different parts of the city within 30 minutes. Once again I love their breakfast which is served on what you need and not an unnecessary display of food that will be wasted eventually. Every stay feels like a home inside a hotel. Facilities like wifi, room service are just perfect. 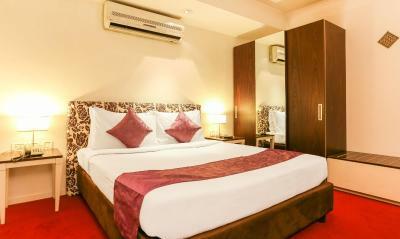 Nice Bed, good pillows and linen, and spacious rooms. Treebo Trend Wilson Garden This rating is a reflection of how the property compares to the industry standard when it comes to price, facilities and services available. It's based on a self-evaluation by the property. Use this rating to help choose your stay! Set in the prime niche of Treebo Select Wilson Garden, Arte Boutique Hotel is just a 1.9 mi away from the popular MG Road. Free WiFi available at all areas. This modern building is located just 1,650 feet from NIMHANS Convention Center, 0.6 mi away from Foram Shopping Mall and Lalbagh Botanical Park. Bangalore International Airport is 19 mi away with Airport shuttle services available at a surcharge. Air-conditioned rooms are fitted with a flat-screen satellite TV, a seating area, a writing desk and tea/coffee making facilities. Private bathrooms include a bath and hot shower facilities. Enjoy a good workout at the fitness center while a 24-hour front desk can assist with laundry and car rental services as well as room service and travel arrangements. After a long day out, guests can unwind at I And Monkey Restaurant which serves Indian, Chinese and continental dishes. When would you like to stay at Treebo Trend Wilson Garden? House Rules Treebo Trend Wilson Garden takes special requests – add in the next step! All children under 16 years are charged INR 500 per night for extra beds. Treebo Trend Wilson Garden accepts these cards and reserves the right to temporarily hold an amount prior to arrival. Please note that guests who check in as couples have to produce a valid marriage certificate. The property reserves the right to cancel the reservation if valid document is not produced. Please note the swimming pool is closed for maintenance until further notice. Inconvenience caused is regretted. The staff were super friendly!! They have to improve the breakfast, WiFi. Swimming pool cleaning. I like staff ‘s behaviour & simple breakfast. Better choice of movie channels. spacious room, fridge and hot plate in room - though I did not use any of them...plenty of storage space. The room was not aired out. It had a bad musty odour. The washroom also stank of sewage. The room was quite small as well compared to other similarly priced ones. The room had a small, hard to even call it that, window which did not even open. The breakfast also has limited options and our stay was 2 days long. So we pretty much got the same stuff on both days apart from one dish. The location as good. It was a quiet neighbourhood. The staff were friendly. They are Charing 30.00 for dental kit which is supposed to be free in all treebo hotels. It seems from 1 st Jan it has become chargeable.